The Hyades have been known since antiquity. The cluster’s name comes from the Greek legend of the seven Hyads, the daughters of the titan Atlas and Aethra. Atlas was busy because he had seven more daughters by another wife, Pleione. These daughters were called the Pleiades. So by legend, the Pleiades and the Hyades are half-sisters. Unlike the Pleiades star cluster, the stars of the Hyades are not named after the sisters. And the Hyades contains some 20 stars visible to the naked eye; the Pleiades have just six. The Romans called the Hyades Sidus Hyantis, the “Raining Stars” because legend tells the Hyads rained tears on Earth after the death of their brother Hyas. 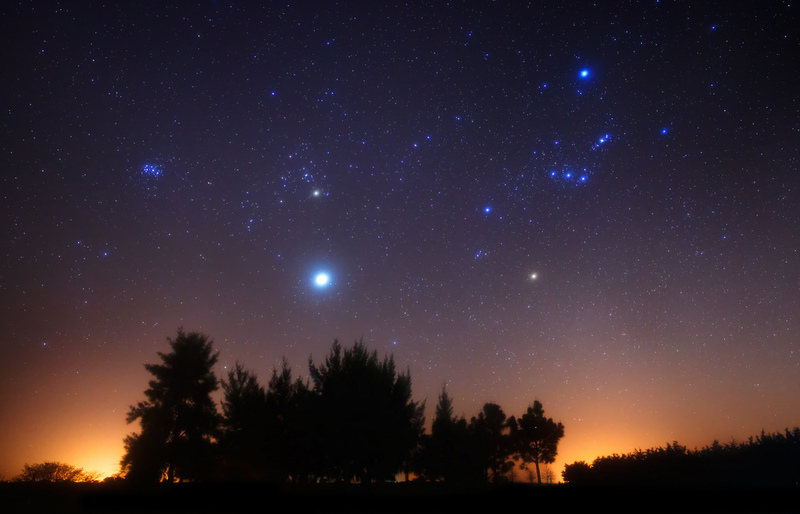 The appearance of these stars also coincided with the rainy season around the Mediterranean. The Hyades star cluster makes up the V-shaped head of the constellation Taurus, the Bull. Click to enlarge. The center of mass of the Hyades is just 151 light years away. So save for the Ursa Major moving group, which makes up much of the Big Dipper, the Hyades ranks as the closest open star cluster to Earth. Astronomers have carefully measured the apparent motion of the Hyades across the sky and determined it moves away from Earth and toward a point just east of the bright star Betelgeuse. Fifty million years from now, the cluster will appear dim and small, just 0.5° across. The presence of many orange-giant stars suggests the Hyades have been around for some 700 million years. That’s old for an open cluster. It’s likely no coincidence that the Hyades are about the same age as the Praesepe star cluster (M44) in the constellation Cancer. The two clusters have a common motion through space, and likely formed together out of the same massive cloud of gas and dust. The stars of the Hyades. Click to enlarge. The Hyades appears to be dominated by the bright orange star Aldebaran, which appears as the “eye” of the bull and the brightest star in the constellation Taurus. But Aldebaran is not associated with the Hyades. It’s much closer… just 65 light years away. You need no telescope to observe the Hyades. The cluster is spread out over a patch of sky as large as your fist extended at arms length, and 11 stars shine at magnitude 4.5 or brighter. A modest pair of binoculars reveals dozens more stars, and the whole cluster is quite dazzling. Once you locate the group in the sky the map below will help you find your way around. (Image at top published under the Creative Commons Licence. No alterations were made).